Emille Mustafá Córdoba y Morales (Em for short) is a busy woman – a very busy woman. The day before this interview, she is in Tampa FL, throwing a birthday celebration for her loving husband and business partner, Azarías (Z for short). They are celebrating his birthday by having a cigar event at Cigar Castle, where Z will be rolling fresh cigars, as well as showing off their remarkable line of cigars. Z & Em are two of the nicest people you will ever meet. This is a huge part of their success. You genuinely want to see them succeed because they are the kindest, most sincere people on the planet. The fact that they are married to each other is just a bonus. Em handles the marketing & business side of the brand. She is the one who you call your order to, she handles the accounting, she maintains all the little details of the business. She does all this while driving with Z from shop location to shop location for cigar events or to just talk to shop owners & consumers. One of things you will find when you speak with Em is just how sweet and friendly she is. She is a genuine person, and genuinely cares about the people she encounters. She wants to listen to what you have to say, and offers her thoughts freely. There is no pretension at all. She loves to share. Z and Em have created a line of cigars that are superb. They offer the Front 9 & the 19th Hole – cigars made for golfers (Z is an avid golfer). They also have the Puro Pinar & the Family Reserve – these two cigars are made to be puro Cubano – pure Cuban. The Family Reserve is inspired by Z’s grandmother. Abuela was a cigar roller & enthusiast long before it was popular for women to smoke. Z’s Abuela inspired the entire line, actually. Z tells stories of sitting by his grandmother as she rolled cigars & smoked. It is for her that the line is named. In addition, Z & Em offer special limited editions like the two Claves and the beautiful Grand Salomone. 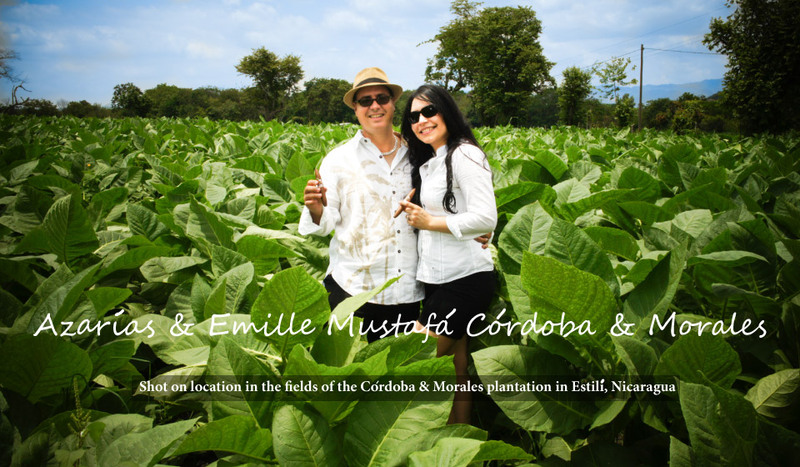 We, at Stogie Press, have known the Mustafás for about a year and a half. They are amazing people. We hope you give their cigars a try. This entry was posted in Cordoba and Morales, Featured Article. Bookmark the permalink.